Like many people I’m not fond of going to the hospital even if I’m just visiting people. But thinking back I can’t recall any reason or situation that would have caused this. On the other hand I have no problem with getting shots even though that’s a pretty common fear. 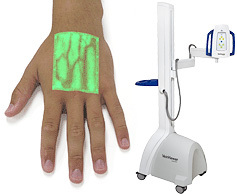 Hoping to reassure worried patients and to make the nursing staff’s job a bit easier Luminetx (I think I’ve typed that wrong at least 5 times this article) has developed the VeinViewer which is a pretty slick machine that makes finding a vein for administering a shot a cinch. Here’s how it works. First a light source emits a harmless, near infra-red beam that only gets bounced back by the tissue surrounding a vein. A video camera then captures this reflected near infra-red light and an image processing unit boosts the contrast. A TI DLP projector then projects this image back onto the skin as an easy to interpret visual overlay. Random stabbings into the arm of a patient will be a thing of the past! And while that image makes it look like a near fatal level of radiation is being administered the device is actually pretty harmless.